For the first time since 1993, Russia won the IIHF World Championship! They were the first to do it on Canadian ice, in the historic Colisée in Quebec City. Even before the game started, Russia had enough reasons to triumph over the hosts and keep the World Championship home ice jinx going. Canadian law enforcement did not allow the team bus to approach the arena, forcing Russia’s players to walk almost a kilometre to the game. Coach Vyacheslav Bykov’s team was further upset by falling behind 3-1 and then 4-2 largely due to time spent killing penalties. Goalie Evgeni Nabokov, fresh out of the Stanley Cup playoffs, was a spectacular addition for the playoff round and was overworked by Canada’s behemoth forward lines in the first two periods of the final. 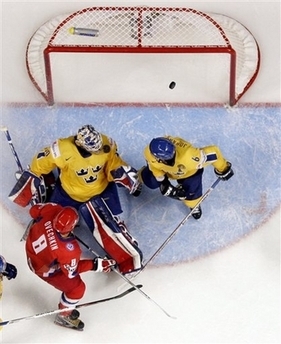 However, Canada’s netminder Cam Ward was under greater pressure in the latter half of the game. 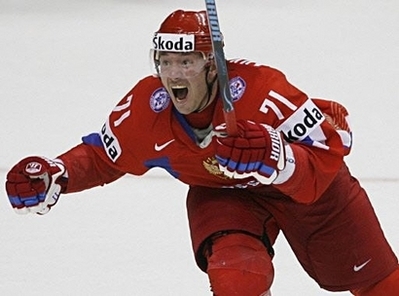 Ilya Kovalchuk emerged as the hero, saving his only goalscoring at the tournament for tiying the game with five minutes remaining and then winning it on a powerplay in overtime, with the talented Fedorov, Ovechkin, and Semin also on the ice. Fedorov was the only Russian player to have previously tasted gold at the WC, in 1990 with the Soviet team. The energy and quality of the final match has surely set a new benchmark in modern hockey and continued a legendary hockey rivalry. Russia tied Canada with its 24th World Championship golden finish. Nabokov was named the best goaltender of the championship and placed on the tournament all-star team along with Ovechkin. In the first period, Morozov left the game with a concussion after a hit by Murray. In the same frame, Kovalchuk was ejected for roughing. Goals: Kalinin (Zaripov, Radulov), Ovechkin (Kovachuk, Korneev), Sushinsky (Gorovikov), Fedorov (Ovechkin, Semin), Sushinsky – Sanitz (Forster, DiPietro), Vauclair, Lemm (Ambuhl, Sprenger). Kovalchuk received a game misconduct penalty and a suspension for the next game for a hard hit on a Swiss player. Welcome to Russkiy Hockey! This website is dedicated to the most talented Russian hockey players who bring a different game to the NHL - a game of speed, creativity, and discipline. On this site you can find out about the careers and accomplishments of these athletes, as well as about the history of Russian hockey, the latest stats of Russian hockey players, and the national team's successes at international tournaments. Enjoy your visit!